If you’ve done all you can with body weight exercises and your dumbbells, a barbell makes the next great addition to your home workout equipment. Here is what to look out for when buying a barbell and how to safely use it at home. Do You Need A Barbell? Before you spend ten to fifteen minutes of your lifetime on this article only to realize at the end (of the article, not your lifetime) that a barbell is for your current workout efforts as useful as a cyst on your buttocks, let us mention this: you generally don’t need to buy a barbell if you are just starting to work out. The earliest occasion where one come in handy is after about one year of continuous training. I bought my barbell only after three years. At that point I had done every possible variation of dumbbell rows and couldn’t budge my lats to progress with them any further. I finally also got bored with them out of my mind. Given that outside of pull-ups and rows there is little variation in home back exercises, a barbell was a useful addition. For a number of chest and leg exercises I still prefer my dumbbells. Not only do they still get the job done, they also are way less hazardous to the surrounding furniture and me (see below). Still with me? Then let’s get started. When you walk into a fitness store or type “barbell set” into the search of your preferred shopping site, the first thing you’ll notice is that there are so many different lengths of barbells and no explanation what each and everyone is good for – anything goes from 4 ft (1.2 m) to a whopping 7.2 ft (2.2 m). The general rule is that the longer the bar, the more weight it can handle and the wider the stance you can have when using it. These two are important if you plan to do squats or bench presses, as very short barbells won’t be ideal for these types of exercises. On the other hand, shorter ones work well on exercises such as shrugs or front raises. If like me you want to go the longest way possible with just one barbell, go for one with a length of 60 to 63 inches (1.50 – 1.60 m), for example this one . It’s long enough to do deadlifts etc., but not so long that you can’t use it for exercises you do with shorter barbells. It also is the length which in my case allows the furniture to survive when I exercise in what is normally my study (yeah, that goes into the compromise part as well). If you started with dumbbells then you probably already have plates for them and want to keep using those with your future barbell. However, the central hole in dumbbell plates is usually 1 inch (2.5 cm), the standard diameter of most dumbbells. 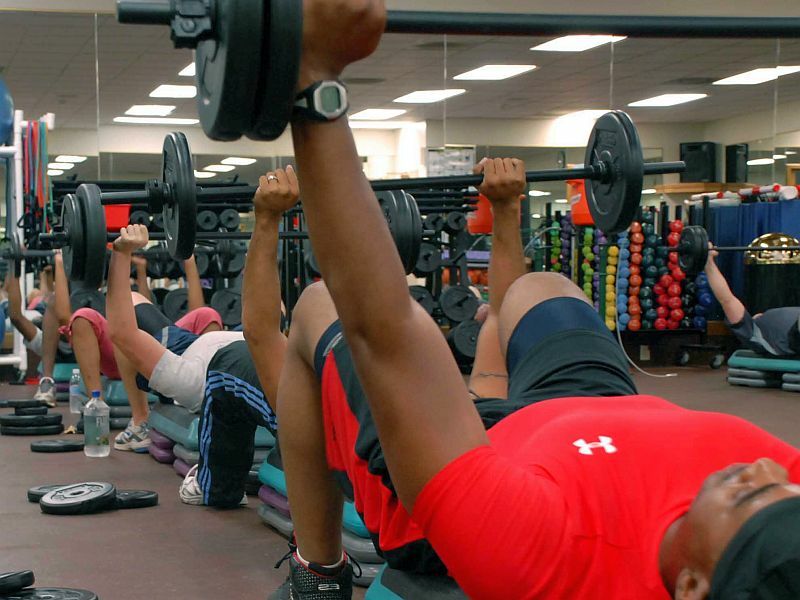 Barbells on the other hand come in two diameters: the 1 inch as above, or 2 inches (5 cm). Make sure the diameter of the barbell you buy goes with your existing plates, if you don’t plan on buying new weights just for the barbell. Barbells (as well as dumbbells) come with threaded or unthreaded ends (the portions of the bar where the plates go on). On those threaded, the plates are held in place with spinlocks you screw on, while on the others you have the choice between spring collars, which you squeeze to go into place, and those you slip on and work like a vice. A spring collar (right) on a barbell. Personally I prefer spinlocks, as I find them the fastest to use, but you may want to have a look at the others and find out what suits you best. There are two things you should avoid when barbell shopping: hollow barbells and those you assemble from pieces. I’m not sure if sets like this one you find outside of Germany, but should you encounter them, be aware that being screwed together is practically a built-in weakness in these barbells. They usually can’t handle more than 110 lbs (50 kg). Hollow bars you normally only get with cheap dumbbells, but I have seen at least one e-z curl bar of that ilk. They usually handle even less weight than the kits above and trying to clamp spring locks on them often ends in disaster. Jupiter knows if someone actually sells full-blown hollow barbells, but you just may want to make sure what you buy is solid, if you see a price for a barbell that seems like a steal. 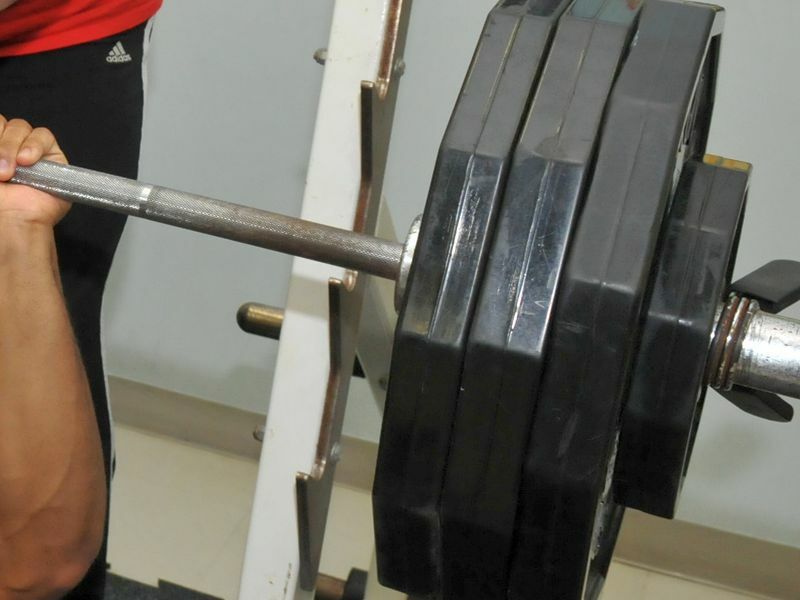 Barbells, especially the longer, thicker ones, can handle loads of weight. But please don’t attempt maxing them out without safety precautions if you work out at home and by yourself. It is less than two years ago that a teenager killed himself with his barbell. For doing squats that means you should have a power rack in place (this one looks like a good deal to me ) and when doing bench presses this basic safety tip is the least you should follow. If you, like me, can have or do neither, then do those lifts with your dumbbells and reserve the barbell for auxiliary work (barbell rows after pull-ups, for example) or exercise variations that don’t endanger yourself (eg. instead of full squats, hack squats). Pictures courtesy of “Marij. Muscle” and the U.S. Air Force. I think that barbell isn’t needed especially with the stuff like Gymnastic Rings. You can get jacked at a low cost. For lower body though it is a huge addition and greatly needed. Seriously, these can work great. Tatianna is swearing by aerial exercises. How did you know I was planning on buying a barbell set this month?? I don’t think I’m ready for one, but I wanted to tell you that I’ve been doing the beginner workouts on your site and feeling good! Thanks for all the great info here. Thank you for the praise, Diane!